A handy and ready to use insect Killer with a rapid action for quick results. Reclaim your fruit, vegetable and flower crops from pesky pests that inevitably occur. Will control greenfly, blackfly, mealy bug, red sapider mite, and soft scale insects. No harmful residues left, and safe to use near children and pets. Supplied as 1L Ready To Use Spraygun. 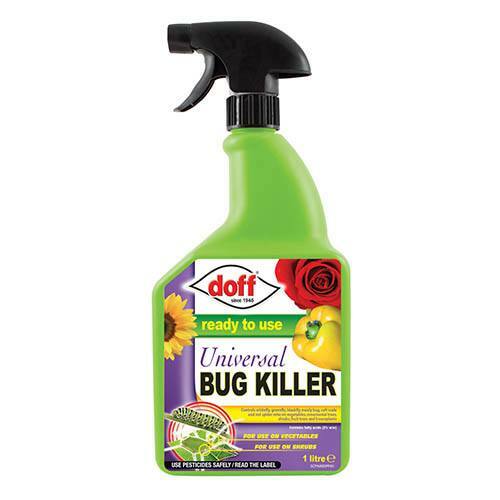 A handy and ready to use insect killer - reclaim your fruit, vegetable and flower crops from pesky pests that inevitably occur. Will control greenfly, blackfly, mealy bug, red sapider mite, and soft scale insects. Use on fruit, vegetables, and all plants and trees. Has a rapid action on contact with insects for quick knock down. No harmful residues left, and safe to use near children and pets. 1L spraygun, ready to use. Contains natural fatty acids. Always read the label before use.